(Bloomberg) -- Japan’s regional banks need to stop their fixation with the old-fashioned buy-and-hold strategy and be more nimble to make the most of their investments, a three-decade industry veteran says. The current low interest-rate environment calls for lenders to adopt a trading mentality and look to lock-in capital gains when they can, instead of focusing on long-term valuations or set targets, said Naoto Oguri, who spent about 35 years at Shizuoka Bank, most of them in the markets’ division. He left the regional lender in 2015 to set up an advisory firm the following year. 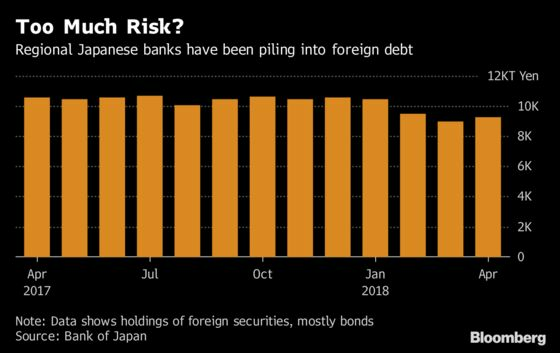 Surging Treasury yields and the political turmoil in Europe are complicating matters for Japanese banks, who have been flocking to overseas bonds in recent years to bolster returns amid near-zero interest rates at home. The lenders now face a dilemma about whether to sell down their holdings in anticipation of further price declines, or incur huge valuation losses. Their mistake was that in the quest for larger gains, they missed the ideal time to sell the securities, Oguri said last week. Then, when yields began to rise, the fear of incurring unrealized losses kept them from buying at levels that presented a good opportunity to re-enter, he said. The Bank of Japan’s negative interest-rate policy is pressuring domestic lenders to take too much risk, Takahide Kiuchi, a former BOJ board member, said in an interview last month. Earlier in 2018, the central bank itself called attention to some banks’ increased investments in foreign junk bonds and hard-to-divest securitized products, saying the financial institutions should guard against the impact of U.S. monetary tightening. Losses related to government-bond holdings at 82 regional banks more than tripled to about 118 billion yen ($1.1 billion) in fiscal 2017 from the previous year, according to a report published by SMBC Nikko Securities Inc. in May. Nagomi Capital provides advice to smaller financial institutions on fund allocation and advises bank presidents and senior managers on organizational reform. The firm also runs a one-year course on asset management. With Japanese funds piling into bonds of some European countries in the past few months at the expense of U.S. Treasuries, Oguri also warned that they should be wary of a sudden reversal in yields when the European Central Bank normalizes policy. Investors from the Asian nation boosted holdings of Italian and Spanish bonds in April, just before government securities in the two countries slumped, according to data published by Japan’s Ministry of Finance Friday. The purchases of Italian debt were the biggest in two years, while those of Spanish notes were a record in data compiled by Bloomberg starting in 2005. The U.S. 10-year yield may top at 3 percent in the near term, Oguri said, adding however that the markets are yet to determine where it will peak out. The yield climbed to an almost seven-year high of 3.13 percent mid-May and has since retreated to 2.92 percent.